What a difference a change makes. Having been shook-up with eight changes going into the dreadful defeat to Burton Albion on Tuesday night, Nigel Pearson rung the changes again against Blackpool - to great effect. A balance was introduced to the team that stifled the Tangerines' midfield and allowed the Foxes' to attack on two fronts, utilising both wings and the centre of the park. Whatever he said to damn or motivate the players, it worked and put City back to winning ways. City's lowest league attendance. At least, this new low bettered the measly 19-odd thousand low of last season. It is a clear indication from the fans that things are not good at the club. It probably isn't a direct reaction to Tuesday's loss but, with the game live on TV, why should fans bother to fork-out thirty quid each to see their team play? It's something the owners should address if they wish to see their business remain in profit. What a nuisance Jamie Vardy made of himself against the Seasiders! His ability to creep behind the defence caused countless issues for Blackpool's defence who simply couldn't deal with him. He had two shots blocked early on and had the ball in the net in the second half, only to be ruled-out for a very poor offside call. Vardy seems to have an acute and dangerous understanding of the game unfolding around him and he links nicely with the midfield and his strike partner to afford himself space and time on the ball. Yes, he is easily muscled off the ball but as he plays more games at Championship level that will improve. The goals will follow. This was another accomplished and assertive performance from Liam Moore, a player whose standing improves with each game he plays. Against the Seasiders he was shunted into playing a wider role, thanks to the late injury to Richie de Laet, and once more he completed ninety minutes with aplomb. Thanks to his youth he is able to adapt well to late changes and to alterations to the personnel alongside him and, thanks to his emergence as a first team regular, he is getting more game time and improving as a result. A solid performance from City's often overlooked winger, whose pace on the left flank continually caused problems for Blackpool's defence. His shooting and crossing (one each aside) remain generally errant but he kept drawing the Tangerines' full-backs towards him and created space in the penalty area that better deliveries would have exploited to dangerous effect. Combine Dyer's rapid pace with Ben Marshall's usually sound delivery and Leicester City would have one heck of a player on their books. Solid enough in his first league appearance as emergency left-back. It is unusual for a player to show such different form overnight, but that is exactly what Paul Konchesky has achieved. 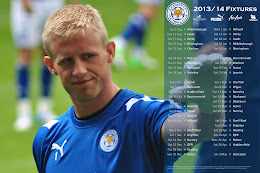 Last season, a pattern emerged where, amongst his stellar performances, Konchesky would have the odd off game. Turn the clock forward and Konchesky is apparently yet to get his season started. Negative football, poor decisions and a woeful touch have characterised the Konchesky of present and, whilst he surely remains a senior presence in the squad, whether he has the skill and longevity to be a defensive leader this season remains in doubt. With Leicester short in cover at the back, each and every defender needs form and be challenging for a starting place. Konchesky would be nowhere near the first team on this form, if Pearson had but one other option. Tired from a late night or weary from transfer speculation, Beckford failed to have the necessary impact his substitute appearance needed. His touch was superb but his shooting way-off and, with City remaining short of goals (despite this statistic that City have found the net in every game so far), he will not challenge the Vardy/David Nugent partnership on this form. This was by no means a bad performance by Sean St Ledger - and as part of a defence which claimed a clean sheet it is harsh to see the Irishman amongst the Losers - but he remains a yard short in terms of fitness. St Ledger survived this game thanks to his experience and a lack of options at the back. He must return to full fitness quickly, as at present St Ledger is the Foxes' third-best centre half.